Benefits of Controlling Trypanosomosis in the Horn of Africa, by Timothy Robinson, Giuliano Cecchi, William Wint, Raffaele Mattioli and Alexandra Shaw. 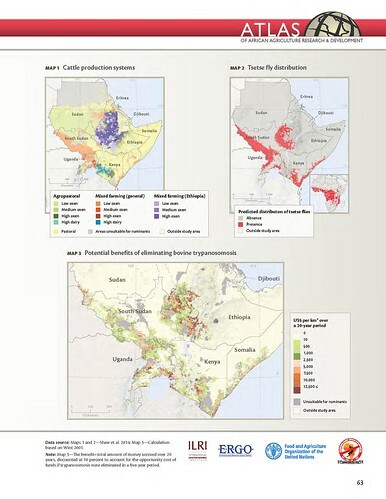 Using the Horn of Africa as an example, the maps illustrate different steps in a methodology developed to estimate and map the economic benefits to livestock keepers of controlling a disease (Shaw et al. 2014). Cattle are first assigned to different production systems as shown in Map 1, illustrating for example, where mixed farming is heavily dependent on the use of draft oxen in Ethiopia, areas of Sudan and South Sudan where oxen use is much lower, and the strictly pastoral areas of Somalia and Kenya. Information on the location of cattle and production systems is combined with the distribution of tsetse fly species in the area (Map 2) to estimate the presence and absence of trypanosomosis, a parasitic disease transmitted by the tsetse fly. Herd growth and spread is modelled for the current situation, and for the simulated removal of trypanosomosis. The outputs of the model are then presented as a map of the financial benefits to livestock keepers that would be realized from trypanosomosis removal, expressed as US$ per km2 (Map 3). The estimated total maximum benefit to livestock keepers, interpreted also as the maximum level of losses avoided, in the Horn of Africa amounts to nearly $2.5 billion, discounted at 10 percent over 20 years to account for the opportunity cost of funds— an average of approximately $3,300 per square kilometer of tsetse-infested area. Map 3 shows how these benefits vary spatially. African animal trypanosomosis reduces the productivity of livestock, especially cattle, when it sickens or kills them. It also affects rural development and livelihoods more generally by limiting options for mixed farming and hindering a balanced use of natural resources. Moreover, in many areas the parasite causes sleeping sickness in people; a highly debilitating disease which if not treated is lethal. Deciding where and how to intervene against this disease requires knowledge of relevant socioeconomic dimensions, such as poverty levels and the role of livestock in people’s livelihoods. The map of potential benefits from trypanosomosis removal in the Horn of Africa can help decisionmakers prioritize interventions by highlighting areas, such as Ethiopia, South Sudan and Kenya, where the financial return on investments to control the disease would be highest. Tags: IFPRI, Tim Robinson. Bookmark the permalink.